Few car companies have undergone more corporate ownership changes than TVR. In 1965 the company was purchased by Arthur Lilley and his son. It took a while for production to get going again on previous models but the demand really wasn’t that strong. So the new TVR commissioned Fissore to build a prototype two-door sports car. Fissore returned with this, the Tina (named for the daughter of Gerry Marshall, a British racing driver and associate of the TVR owners). Unveiled at the 1966 Turin Auto Show, the Tina was shown as both coupe and convertible. They were based on the Hillman Imp, so the 55 horsepower 875cc straight-four is located in the rear. TVR lacked the funds to get this project off the ground and in 1967, once the Griffith had been put out the pasture, TVR went with the new Tuscan instead. Tina Marshall, this car’s namesake, inherited it when her father passed in 2005. It was restored to the condition you see here. The Tina Convertible Prototype is still out there, but here’s your chance to acquire the coupe. It should bring between $40,000-$52,000. Click here for more info and here for more from this sale. 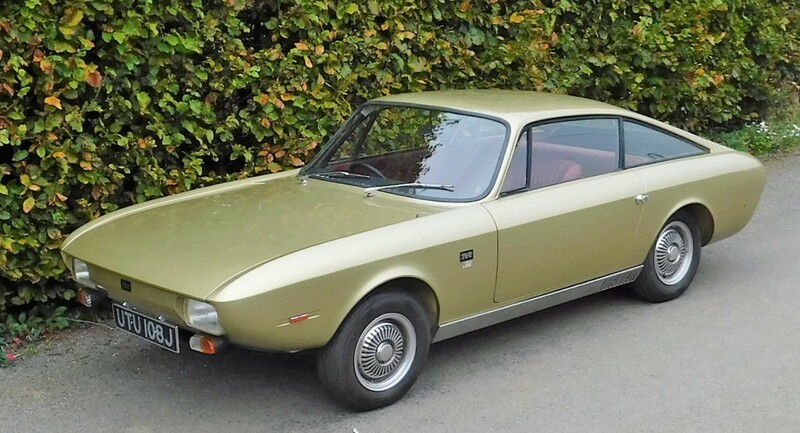 This entry was posted in Uncategorized and tagged 1967, auctions, cars, classic cars, fissore, prototype, silverstone auctions, tina, TVR by classiccarweekly. Bookmark the permalink.